How do decisions like trading out copper for painted metal come about? Copper was a desired aesthetic component of the Visitor Center. It matched the use of copper at the Chickasaw Cultural Center which was the primary reference point and inspiration for the architectural character of the Visitor Center. The reason for considering painted metal was a concern over the copper being touchable by the public thereby creating visible markings from hand prints and its cost. 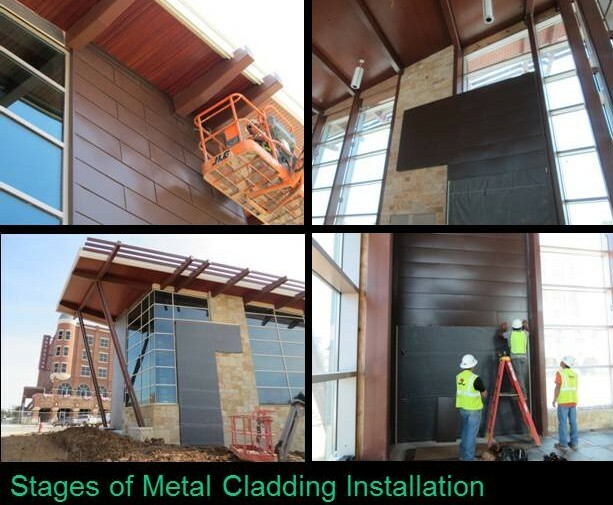 The decision to consider a substitution for the copper cladding was bundled with other cost reduction items that included omitting the exterior water feature and omitting interior sidelights to offices. A prior reduction included the omission of the photovoltaic power generation panels on the roof. Addressing cost reduction is not uncommon when there is a desire to reduce the scope in order to maintain a certain budget for the project. And this was the case for the Visitor Center. This exercise referred to as Value Engineering involves a search for substitutes that will not compromise function while reducing cost. It’s interesting that this search for acceptable substitutes grew out of a war-time need driven by a shortage of skilled labor, raw materials, and component parts. GE came up with this approach and termed it “value analysis.” They found that substitutions often reduced costs, improved the product, or both. Sometimes it is seen as a balance of performance and cost. In architecture, function is a driving value to be achieved. “Form follows function” became a credo for the modernist movement; we can credit the phrase to Louis Sullivan famous Chicago architect who led the development of the skyscraper. It was later adopted and professed by Louis’ assistant Frank Lloyd Wright. The beauty of architecture is embodied in aesthetics. And while aesthetics is often subjective, there is always a strong consensus of whether an architectural solution is good design. Good design includes its aesthetic qualities. It is always difficult to see aesthetics give way to function for the sake of cost. Value engineering is focused entirely on function; aesthetics loses out. The impact of cost decisions which are made early in a project are sometimes not dealt with until much later in the construction process. We are dealing with that decision on copper cladding now. Copper is such a rich material visually with warm characteristics and its slowly changing patina. It seems that copper’s beauty completely overpowers any detracting characteristics; most notably that of oil canning which is the natural subtle warping of its surface. Metal panels are plagued with this detracting feature and unfortunately prefinished steel panels do not have the same warmth to overcome this visual imperfection. Copper is soft and malleable and easy to work. However, it takes great craftsmanship to mold it into cladding that is aesthetically pleasing. The prefinished steel wall cladding is much stiffer and takes greater force to bend and crease where you want folds to occur. One might argue that it takes even greater craftsmanship to make steel sheet panels look as good as copper. We have struggled with achieving an acceptable level of quality in the steel cladding. The exterior effort was halted by the contractor to rethink the approach to its installation as they were not pleased with the initial results. The interior cladding has been installed, entirely removed and is in the process of being reinstalled. The vertical metal wall cladding is being installed by the metal roofing subcontractor. We believe that the wall cladding takes a different and greater level of craftsmanship than the roof. Does the subcontractor have the skilled craftsmen needed to perform the wall cladding work? Doubts fill our mind as we reflect on the decisions that got us here. We are in the final days of construction and need to continue forward. Prefinished steel wall cladding can look good with proper attention. We are working with the contractor to achieve the quality that we all know is right for the project.